This image appears on page 204 in the Women's Institute scrapbook - the local identifier number for this particular scrapbook is 5sb. Original photographs included in this Women's Institute scrapbook have had individual records created for them, greatly increasing their accessibility for searching under general keyword terms. See the link - Tweedsmuir History, Castleton Branch, Women's Institute - on the right side of the page to access the scrapbook and go to p.204. Click on the Select arrow for Pages to see the relevant page. The Pages box is located at the top of the page. A history of the Mount Pleasant Farm Forum (of the National Farm Radio Forum organization) appears on pages 202-206. 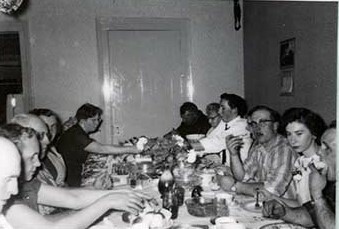 Written under the photograph: "Farm Forum 1958/59 L-R Farm Forum Turkey supper at Don Ducie's home - (New Years) 1958-59 - Alex McComb 2 Bernice Tait 3 Lorne McTait 4 Mae McComb 5 Susan Kemp 6 Henry Kamp 7 Ethel Fitchett 8 Murray Nelson 9 Marvin McComb 10 Shirley McComb 11 Bruce McComb"